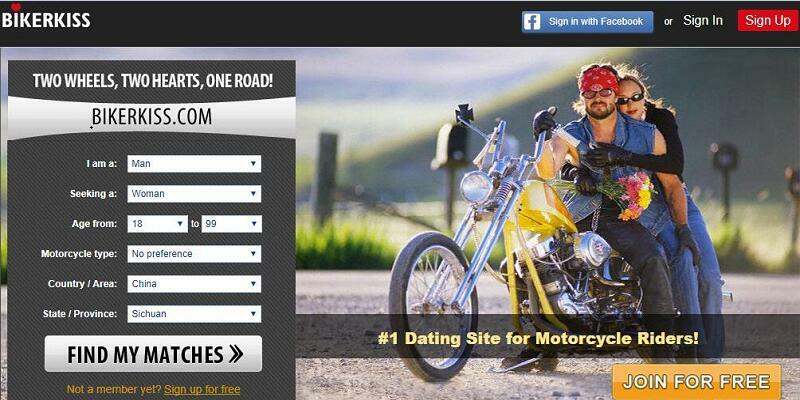 BikerKiss is our #1 choice among the 10 best biker dating sites. The reasons behind its popularity are the exclusive features and verification process by the website. It is the place where you will find the most number of motorcycle friends. Following we are sharing full review of BikerKiss which will help you to know that why you should use it to find a single motorcycle rider. Creating your profile by email at BikerKiss.com is very easy, it only take a few minutes. Making an effective profile is general, but relatively insightful. Apart from routine info like age, height, relationship status, ethnicity, religion and motorcycles you ride, you can also put in your likes and dislikes, favorite your tattoo, how frequent your ride etc. in About Me and About My Matches/Friends part in step 3. Many members appreciate profiles with these simple details and would want to spend time reading your profile. Standard members use limited features for free. Payment types include Credit Card / Charge Card / Check Card / Debit Card, PayPal and Bank Check / Money Order by postal mail. You would have the option to upload up to 26 photos to public, private, motorcycle and tattoo album in your profile. Receive emails and instant messages from other singles and reply to them. Initiate send winks to show someone you are interested. Share first date ideas to get comments and likes. Comment and participate on other’s profile, photos, blogs and forums. Search engine feature can be used to filter members by gender, age, region, username and “Backseat Or Passenger”. Verify (photo, motorcycle driving license). Add questions to your biker matches / friends and answer others’ by private. Post recent activities, including photos and status. Invite someone to a ride. Block from someone contact, or report a concern. Initiate sending emails / chatting online. Respond to others’ first date ideas. Use advanced search function to find users by MOTORCYCLE TYPE, location, distance from you in miles and KMs, keywords, photo count or view WHO’S NEW on this website. View the videos submitted by other bikers. Get your profile listed at the featured members section and ranked at the very TOP of search result. BikerKiss will also give you access to view its verified members list. Get notification about those who have seen your profile/added you to their favorites list/liked your photos/answered your questions. Request to access to others’ private photo album. View others’ last login time. Hide members you don’t like from search results. At this point time, biker dating website is the most sought after place by many single bikers looking for a partner or a date. Also it is the most efficient and secures way for them. However, not all biker dating website is useful and safe. Bikerkiss.com is one of the trustworthy and reliable dating site for bikers that can assist you look for the perfect match. This online dating site for bikers has been assisting all types of motorcyclists, bikers as well as Harley enthusiast and fanatics find their perfect match, serious relationship as well as riding partner for more than fifteen years now. For single bikers looking for special someone with the same interest in life, then BikerKiss.com is indeed the best option. There are no questions about the credibility of this website. In fact many leading media recommend this site for helping many bikers all over the world look for their match. Making an account on this dating site is simple and so easy as well. Those who are new to internet dating could create a good profile. On each single page, there’s a reminder for members to check, when you have no idea of what to type. Also they provide a sample that will serve as your guide. You will need to complete the four steps of signing up in order to improve the chance of finding a right partner. The more details you put in your profile, the more chances of finding a possible match. The information you put in is extremely essential in the dating process, the possible match might get your profile through looking the keywords. Once you put in lots of information about yourself, anyone who shares with similar lifestyle, hobby, as well as interest might find you in the search result. There’s a good chance for getting connect with like-minded members. Being the premier online dating site for bikers, BikersKiss.com didn’t stop enhancing website services in order to please the needs of bikers. To fulfil the need of the bikers, BikersKiss.com creatively built lots of essential features that combine biker lifestyle and dating business together.